Note: A lot of this applies to more than just RC models. 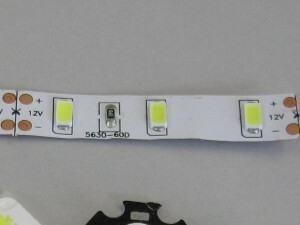 There are many LED types available. These are just a few of the common ones. 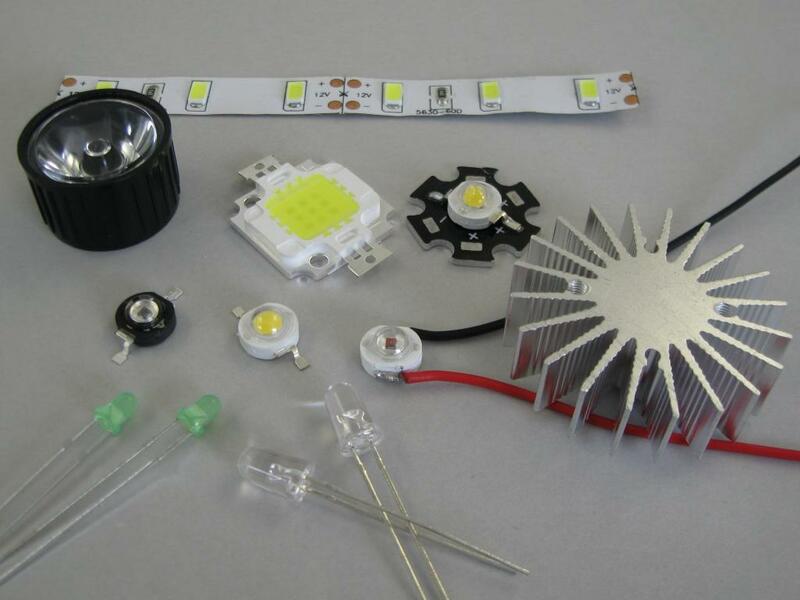 The type of LEDs to use on RC models will depend on how bright you want them to be. Smaller LEDs are good for smaller models, but will not be very visible out doors. Larger LEDs will be more visible out doors but will use a lot more power and may get hot. The complexity comes when you start looking at voltage, current, watts and dissipation or heat. See below. More power = more light, but the way LEDs are rated is quite deceiving. 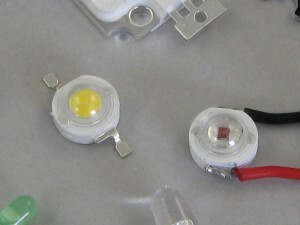 smaller LEDs are rated in mcd (millicandela) and larger LEDs in Lumens. 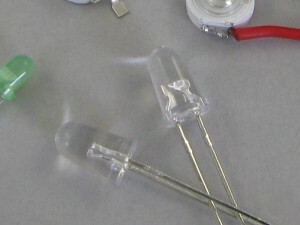 Smaller LEDs are often called super-bright by the manufacturers. This usually just means that all the light output is focused into one really bright spot. Some have beam widths of 3-5 degrees.The same super-bright LED without its lens so that the light radiates in all directions is pretty pathetic. 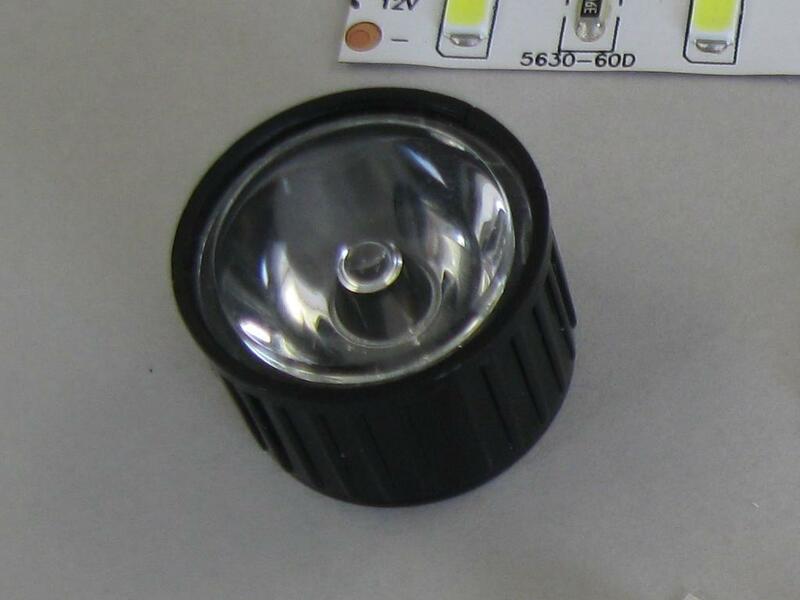 These narrow beam LEDs can be quite useful on a model because they are easily visible only when pointing direct at you. Say on a leading wing edge, you will be able to tell when the model is aligned to return From off-axis, they won’t be visible. These LEDs don’t make good beacons or navigation lights. The small LEDs with very wide beam angles are no where near bright enough to be beacons or navigation lights. 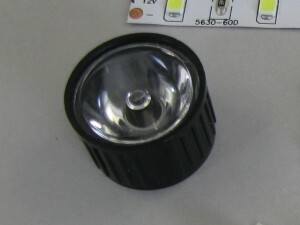 Larger LEDs like the 1W, 3W and 10W don’t have lenses, and the light emits in all directions, usually 120 degrees. If driven hard enough, these can be seen from all directions, and do make good beacons. Note: on model planes, LEDs of different colour (red and green) that appear the same brightness close up will appear quite different at a distance. The red will be brighter and at some point the colours will look the same. Not normally a problem, just interesting. I have experimented with LEDs on RC planes and supplied a few for gliders and multi-rotors. To be visible from a reasonable angle or field of view, LEDs need to be extremely bright. The white and dual colour strobes I supply are visible out to 100+ meters on a bright day, and at greater distances are still visible but not really attention grabbing. On dull days or near dusk they become quite effective, but those are not the best RC times. LED colour variation fades beyond a certain distance; they all appear sort of white. I have supplied a few LEDs with lenses; concentrating the light in one direction. These are much more effective at greater distances, but for wider angle coverage, more than one is required; typically 4 or more. Although quite effective we have had little interest in this approach as it’s a lot more work to install and doesn’t suit smaller models. A strobe effect, of very short duration high intensity pulses is as or more effective than a flash (longer on time). The strobe greatly reduces average power draw and LED heating, and eliminates the need for LED heatsinking. These are common and cheap. Available in many colours, including red, green, yellow, white, and blue. Typically limited to a maximum of about 20-25 mA. That is 0.025 amps. This means a maximum power rating of about 65 mW depending on colour. The long leg is +Ve. 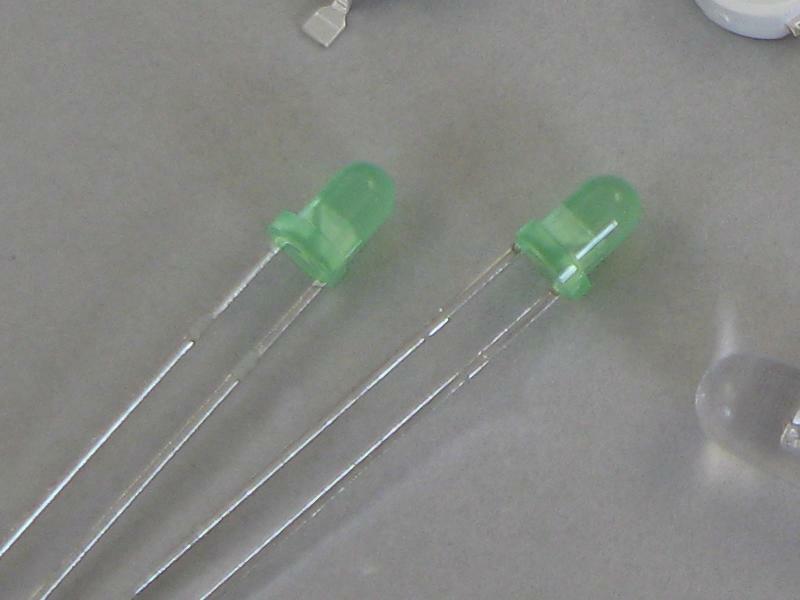 These are good as small indicator LEDs or on small models. Typically limited to a maximum of about 50 mA maximum. That is 0.05 amps. This means a maximum power rating of about 120 mW or 0.12 watts, depending on colour. The long leg is +Ve. These (like the 3mm) usually have a built in lens to focus the light. See lens below. These are now quite common, reasonably priced and can be very bright. Also available in a range of colours. The LED shown with yellow centre is white – the yellow is a phosphor. The other could be red, green, blue etc. These are typically mounted on a heat-sink plate and often also a larger metal heat-sink. These can be very bright. 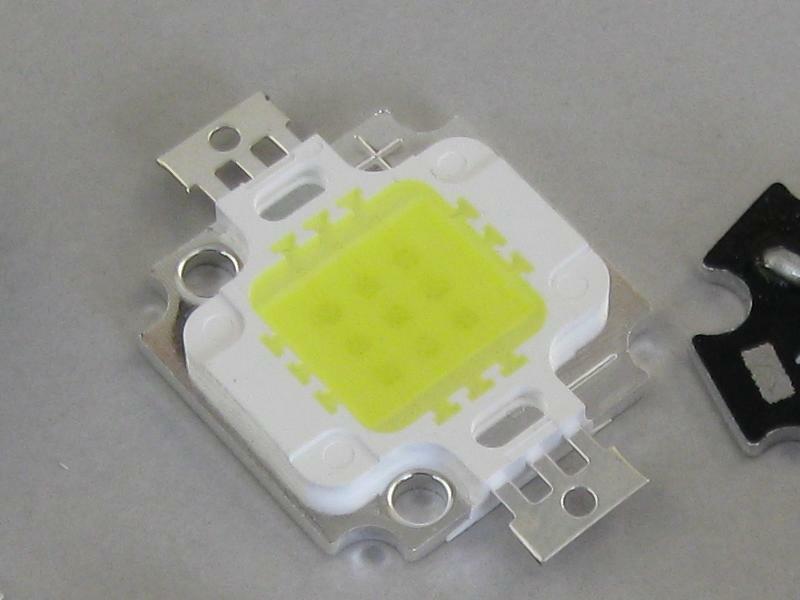 Again, the yellow phosphor indicates a white LED. Typically the darker the yellow, the warmer the colour temperature. The LED shown is a cool white, which I think gives the brightest light. These are great as strobe beacons, but get too hot to be run at high power for any length of time. A brief flash every second or so dissipates little average energy (low power) but produces a very intense light pulse. LED strips are great for planes and multi-rotors. Common colours are red, green, blue and white; also RGB and RGBW. Most strips are configured for 12V power. There are various types available, with different numbers of LEDs per meter and different types of LEDs. The wattage rating per meter gives a good indication of how bright a strip will be. More watts per meter will usually be brighter. Some of the older strips are not very bright. My recommendation is to avoid the waterproof strips. On the strips I have tested, the covering material seems to yellow quite quickly with use and the sticky backing is not very long-lasting. They feel oily, which may be what is affecting teh sticky back. 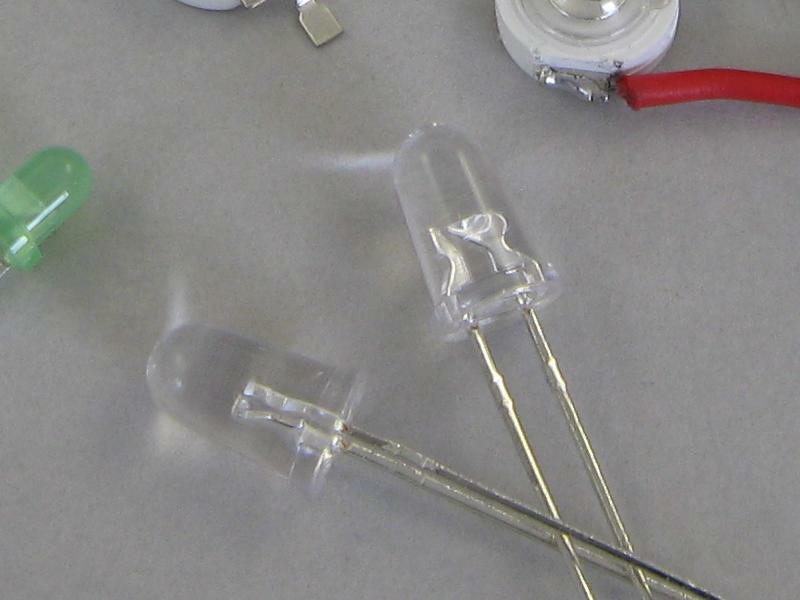 These are lenses for the 1watt and 3 watt LEDs. They are available in various beam angles and come in 2 parts; black and clear bits. 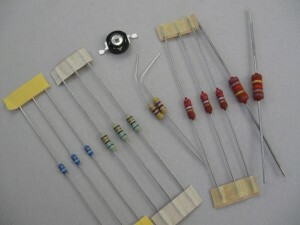 They are intended to be used with the LEDs mounted on the small star heat-sink boards. Think landing lights and very intense beacons. The diagram shows various resistors ranging from 0.25 watt carbon-film through to a 2 watt metal-film. The 3 watt LED gives an indication of size. This image shows three 0.6 watt metal-film resistors (68 ohms) and two 0.25 watt 5% carbon-film resistors. 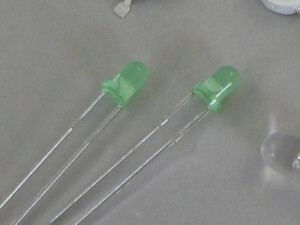 These are probably the most common types that will be used with LEDs in RC models. Note: because a resistor is rated at 0.6 watts doesn’t mean you can always run it at that power. Without cooling it will get hot; often very hot, turn black and emit smoke signals. LEDs are current driven devices, not voltage driven. You apply a voltage, which if high enough causes a current to flow through the LED. The current flow makes it emit light. 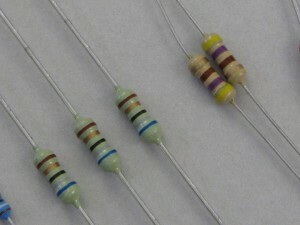 The series connected resistor limits the current to a safe level. Without the resistor or if the resistor value is too low, slowly increasing the voltage will make the current rise rapidly, eventually destroying the LED. LEDs have a specified forward voltage rating that is dependant on their colour. This affects resistor choice and how you can connect LEDs in series. The voltage increases slightly with current. Forward voltage times (x) current through the LED gives you power in watts; and this is the heat that the LED must dissipate, or get rid of. Over about 0.5 watts (continuous operation) generally needs a heat sink. A problem with RC models is that you often have a 3-cell LiPo power supply that can vary between 9 and 12.6 volts. If your LEDs are intended to operate at 12 volts, 12.6V is OK but 9-10 volts is a bit low and may cause the LEDs to noticeable dim or flicker. This is where it can get complicated, especially with higher powered LEDs. LEDs that run hot will not live as long. Basically Watts = Heat. Heat must be dissipated. If it has no where to go, the temperature will rise and eventually something will shut down (if you are lucky), or more likely, will just fail. 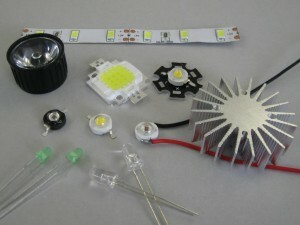 LEDs turn electricity (power) into light and heat; mostly heat. The heat must be removed or conducted away, to keep the LED alive. It is the average power that is important. A 10 watt LED flashed at full current at 5% duty cycle is only dissipating 0.5 watts and does not need a heat sink. A 1 watt LED running at full current continuously with dissipate 1 watt and without a heat sink get too hot and fail. Resistors also dissipate power and get hot. But resistors typically don’t have heat sinks. This means that driving high power LEDs can require voltage and/or current control circuits designed to dissipate the minimum power; wasted power.